A kitty my daughter rescued off the streets. 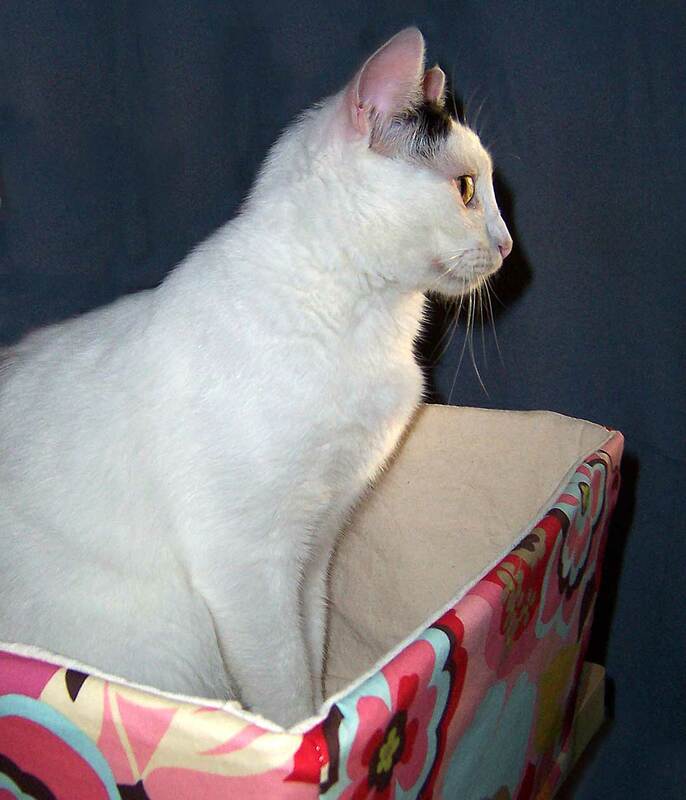 He strikes a beautiful pose in one of my first “test” pet beds! It’s Etsy Friday and time to ring in the New Year with a little bling – for both you and your pet! Check out the beautiful shine of this glittery cat collar by Etsy seller Swanky Paws. 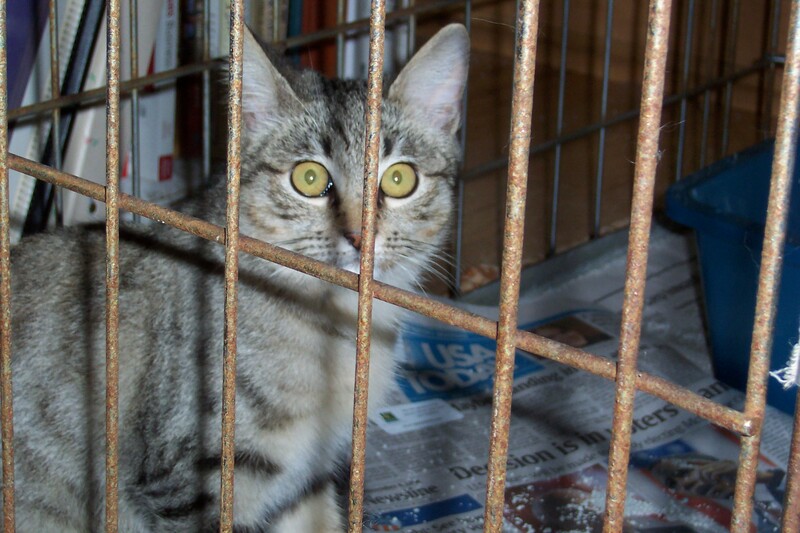 This 3/8″ silver cat collar has a safety breakaway side release buckle and a nickel metal ring. It is bar stitched for strength. If you would prefer this collar for a small dog just let Swanky Paws know and they will change out the hardware to make it appropriate for your pet. In fact if you want to change the color of the webbing or buckle on any of her collars just let her know and she will create a custom order just for you! So pretty! Oh my gosh how neat are these rhinestone “dog tags” for people! They are individually created by Etsy seller Paper and Place. You have a choice of the three styles shown. Just pick your favorite place in the world and let Taylor from Dallas, Texas do the rest. She has a collection of vintage maps, as well as new ones, from which to create your custom piece. The map itself measures 1″ across, and will be protected and slightly magnified by a thick clear glass dome. The full tag itself measures 2″ x 1 1/8″. 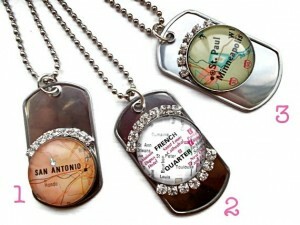 These would be so awesome made as a memento of a special time/place in your life…hometown, place of travel, wedding, etc. And hey, I’m sure she might even create one with a constellation map of the stars, if that’s your destination! The beautiful silver decorative buckle gives this lovely leather dog collar its shine! Custom made in various sizes for cool dogs like yours by Miami Etsy seller The Cool Puppy. Their Maltese provided inspiration for all the super-cute, super-fun designed collars and leashes on their pet site! A matching lease is available for this particular design. 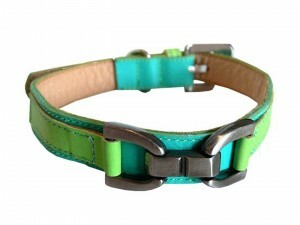 My daughter loves the “dog bone” design, and I also think the colorful hollow stud collars are particularly adorable. Check them all out today! 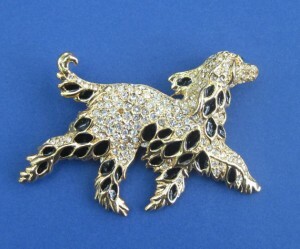 Check out this one-of-a-kind lovely vintage rhinestone and enamel springer spaniel dog brooch for sale on Etsy by Every Thing Dogs and Cat. Gotta love that business name! This brooch is approximately 3″ long by 2″ wide. The inset enamel on the feathered legs and ears is a rich navy blue. I have to say I’ve seen a lot of dog vintage jewelry, but the design on this piece is exceptionally nice. All pieces on this website are vintage dog and cat jewelry. Check out the amazing video from photographer Seth Casteel of Little Friends Photo for examples of “before” and “after” pet adoption photos. Seth started SecondChancePhotos.org after noticing that the photography of adoptable pets in his local shelter was not as good as it could be. 1) A good digital SLR camera; I use a Sony Nex C-3. Pets move quickly, so I recommend that your camera take at least 3-6 frames per second. 2) Not using flash, but rather making sure you have good light. If indoors use the natural light near windows! 3) Being patient and taking LOTS of photos. With digital photos you can easily discard the ones you don’t want to keep. 4) Using some computer software to enhance those great digital shots you just took. I use Photoshop, and several apps on my i-Phone. 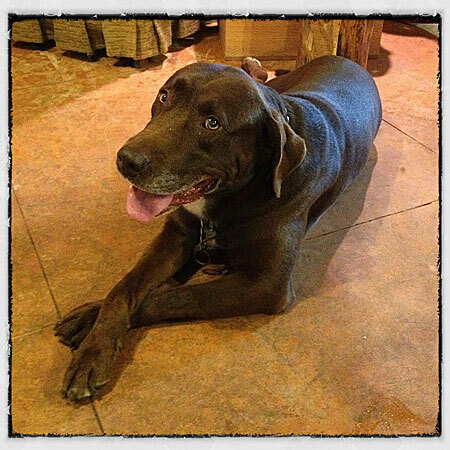 For some super suggestions on taking great pet photos, check out the “Photo Tips” page on the Second Chance Photos website. And then start clicking that shutter button! Also consider attending one of the pet photo workshops offered by Second Chance Photos, and offering your newly honed skills to a local shelter. All workshops are free and open to the public, but do require an RSVP. Workshops for 2013 are currently being organized, and will be updated on the Second Chance website when available. I’m crossing my fingers that one will be held near Austin, Texas! And staying happy going into the New Year!